So what was my first impression of the Sharkoon DarkGlider. Well first of it’s a very big mouse, so if you have small hands this is not the mouse for you. I have medium hands and at first the DarkGlider was too big for me, but I got a hang of it after a while. But I have to say the mouse looks very good at first glance. Let’s take a closer look at the DarkGlider. First off the thumb rest. There’s not really anything that standout here, which I like. The thumb rest curves out a bit with 2 buttons above it. There are no rubber pads but the few days I’ve been using this mouse my thumb hasn’t slipped once. The 2 thumb buttons are in my opinion perfectly placed. My thumb is always on the furthest button and if I want to press the back button I just pull my thumb back. All the other mice I’ve used so far the furthest button is too far for my thumb. I have to stretch my thumb or even move my hand to reach it. Again I have medium size hands, so this probably doesn’t apply to everybody. The left and right mouse buttons are very light to press. This didn’t really bother me but it might others. 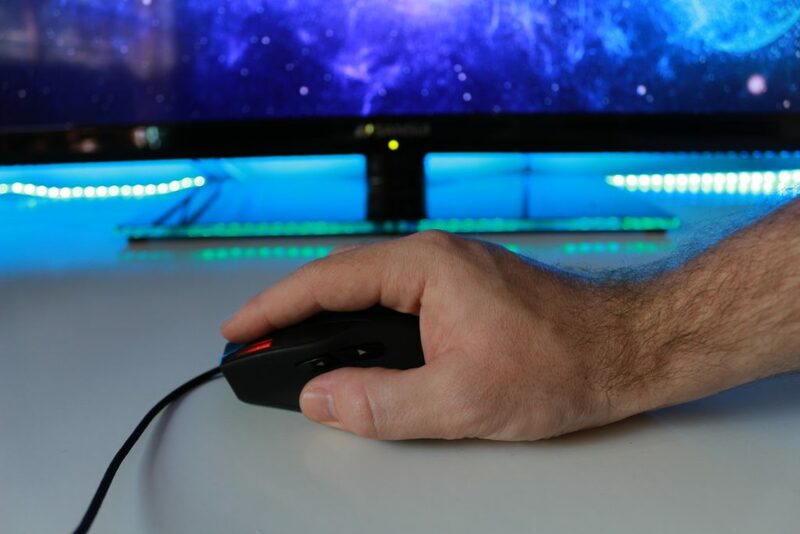 The scroll wheel has a nice rubber grip to keep your finger from slipping and a decent scroll. The scroll wheel is also able to click to the left and right. 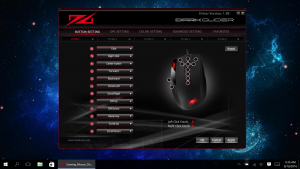 Just before the scroll wheel is a + and a – button that lets you cycle through 6 DPI levels. 800, 1600, 2400, 3200, 5000, 6000. 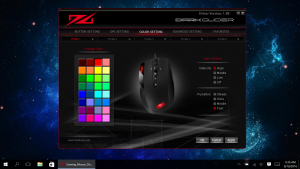 Next to the left mouse button is the Red illuminated digital DPI indicator that shows on what DPI level you are on. The last button behind the DPI buttons is to switch between your favorites, which you’ll see in the software. There are no buttons on the right side just a ring finger and a pinkie rest. The palm rest has a red illuminated logo which looks very cool with all the black. Underneath the mouse is 5 ceramic mouse feet which are super smooth. You are also able to replace them with the extra mouse feet included in the packaging. 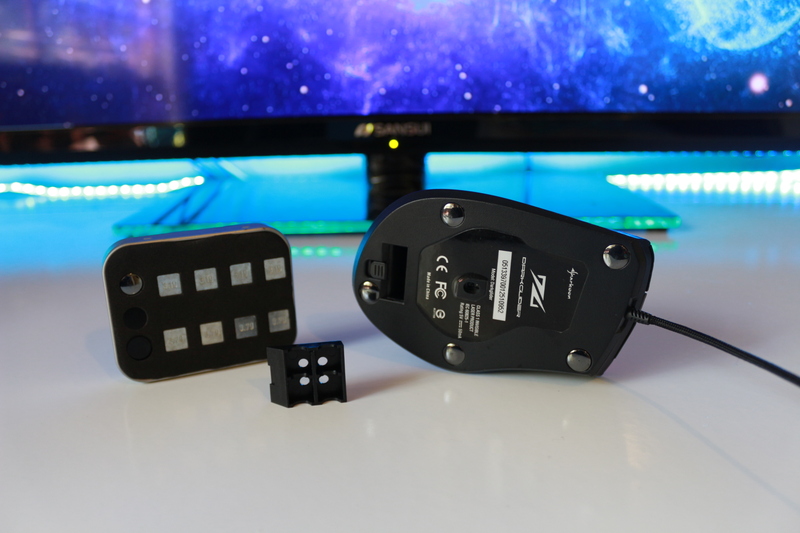 Along with the mouse feet is the Avago ADNS-9500 V2 PRO laser sensor which is amazingly smooth. 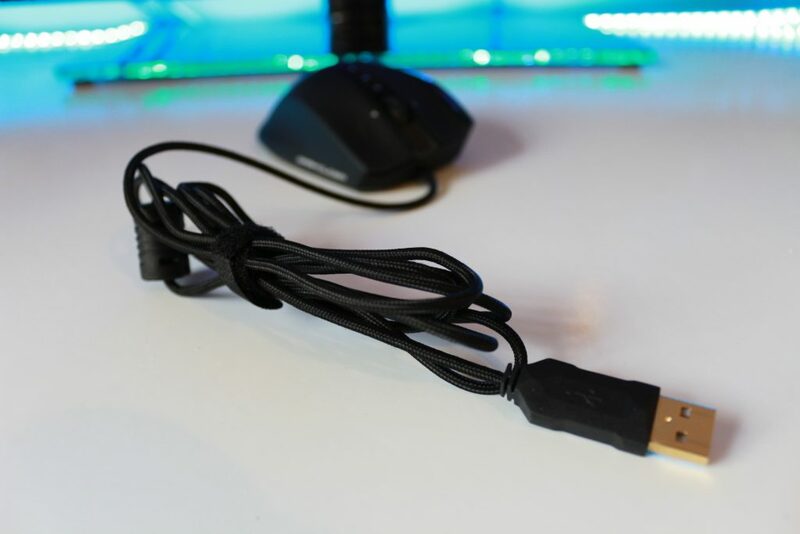 But 2 downsides to the sensor is the 5mm lift-off distance that’s too high and one thing that happened is a small piece of hair got stuck to it and that threw the mouse cursor everywhere. I’m not sure if this is because it is a laser sensor, but this never happens to my Razer Deathadder that has an optical sensor. But this is not a deal breaker because I just turned it over and blew the hair away and it was perfect again. 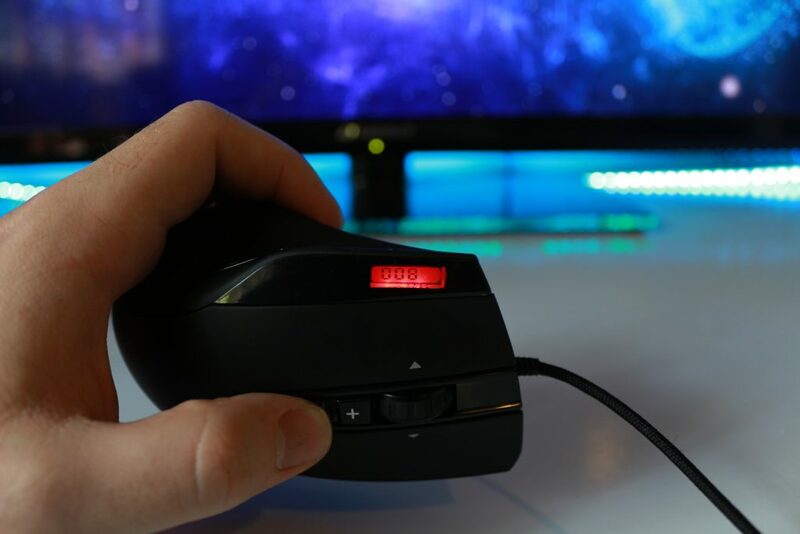 Still underneath the mouse, there is a small release knob that lets you take out the weights for the mouse. You can add 4 weights max of ether 3.19grams or 3.79 grams to make the mouse heavier. The cable is a braided 1.8 meter (5.9 feet) cable with a gold plated USB for some better connection. The software is nice and straightforward. You have your Button Settings Tab where you can give each key a command or assign it to do something else. With that, you also get 5 Profiles you can choose from. 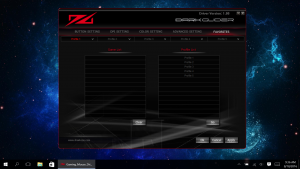 Then you have your DPI Settings tab. There you can change the 6 DPI levels to whatever you want. 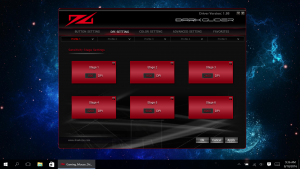 Then switch through them with the DPI buttons. After that you get the Color Settings tab where you can change the palm rest led light logo to a bunch of different colors. 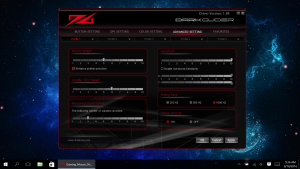 The Advanced Settings tab is where you can adjust all the sensitivity stuff like the mouse speed, double click speed and Polling Rate. The lastly you have the Favorite tab. There you can add games and link a profile to that game. 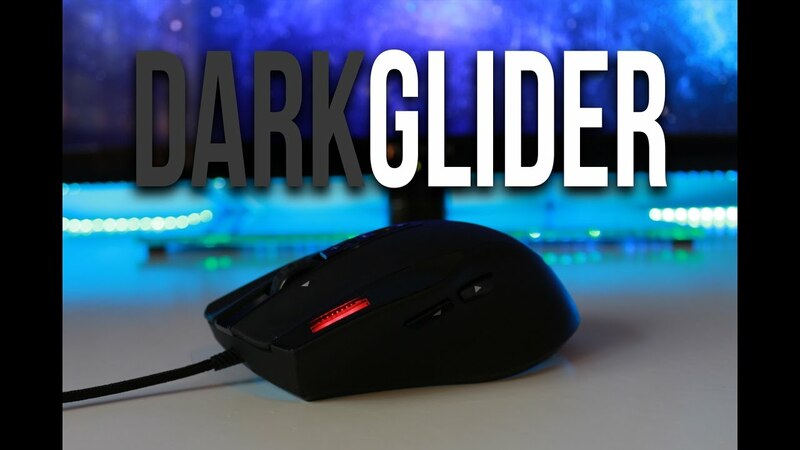 At first I didn’t like how big the mouse was but like everything else if you use it for a while you get use to it and I started too really like the DarkGlider. It’s big yes, but your entire hand fits really well on top of it. 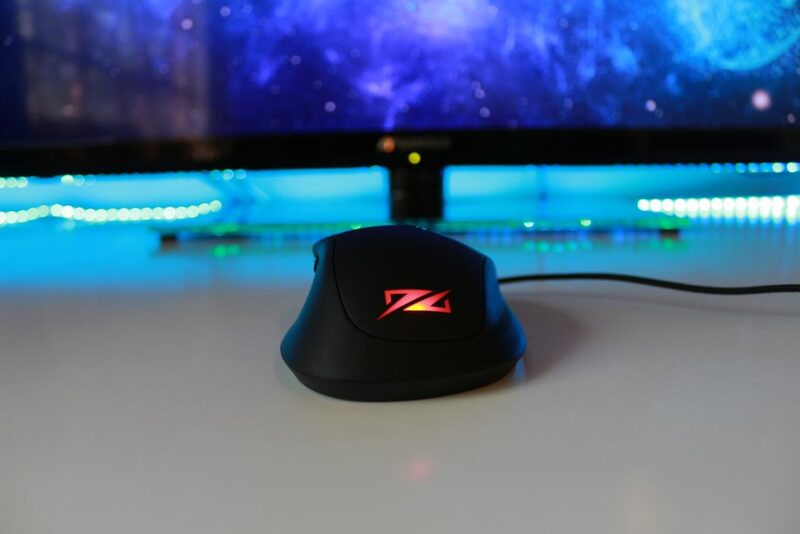 The features I liked the most where the thumb buttons and the super smooth mouse feet. What I didn’t like was the lift-off distance but this is because I play on 800DPI which is low. If you play on anything above 1600 you would not have any problem. But all-in-all this is a superb mouse. 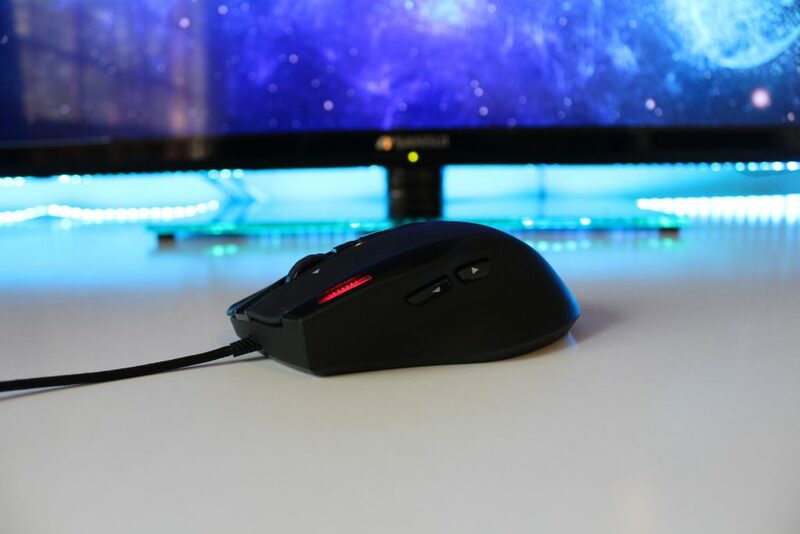 If you have large hands this mouse will fit you perfectly.